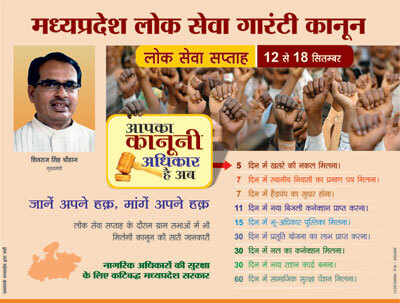 Madhya Pradesh Public Ser vices Guarantee Act, 2010 is the first-of-its- kind in the country guaranteeing the delivery of public services to citizens in a stipulated time frame. The "historic Act" is a reflection of the state's commitment to achieving good governance. The Madhya Pradesh Public Services Guarantee Act 2010 guarantees the delivery of basic public services to citizens within a stipulated time frame and sets in place accountability mechanisms for failure to do so. Under the Act, 52 key public services like issuing caste, birth, marriage and domicile certificates, drinking water connections, ration cards, copies of land records have been notified. A time period has been fixed for the delivery of each service. If officials fail to perform their duties and do not provide these services on time, they have to pay a fine starting from Rs. 250 per day to a maximum of Rs. 5000. The Act provides for a two stage appeals process. In the event that a citizen does not receive notified services in time, he can appeal to the first appellate authority. If the first appellate authority is negligent or if a citizen is dissatisfied with the decision, he can file an appeal with the second appellate authority. The second appellate authority has the power to impose fines and order disciplinary action against officials. Where fine is imposed on delinquent officer, the applicants are paid compensation for the inconvenience caused to them. The path-breaking law provides an effective instrument for realizing the objectives of citizen's charter.